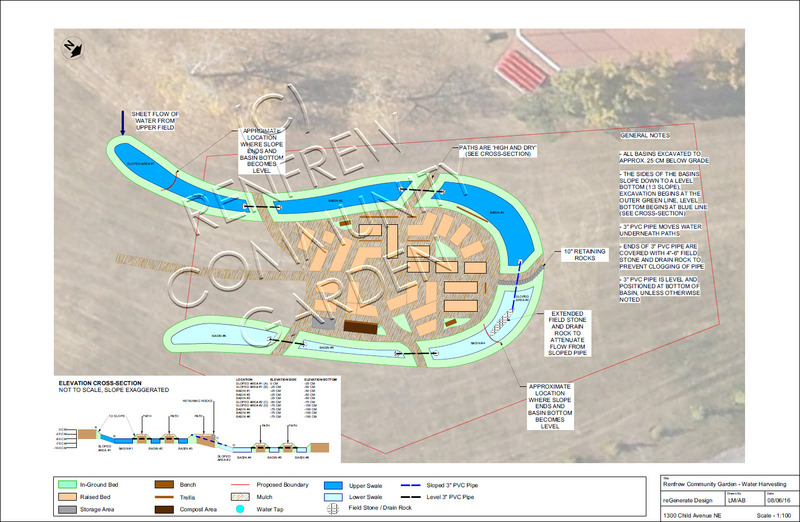 This map describes the watershed management component of the design. “The Renfrew Community Garden design is a multi-functional space that will be a true community asset. The design was created using the principles of permaculture, which combines the best practices of urban design and ecology in a way that maximizes the functionality and beauty of the community garden space. The design provides approximately 30 community garden plots of multiple sizes, which will be raised cedar beds and some of which feature built-in benches. The design of the community garden mimics the street pattern of Renfrew in a subtle but noticeable way that enhances the sense of place of the site and ties into the history of the neighbourhood. Several in-ground perennial beds are scattered throughout the plan to attract pollinators and other beneficial animal life to the area, and there is space for compost, storage and benches. The design is compact and defines the space but also allows for expansion in the future. Surrounding the annual gardening space is a nearly 3,000 square foot food forest that includes 38 trees and shrubs of 18 different species; with the provision for an additional 30 species of herbaceous perennial plants in the understory of the trees and shrubs. The food forest will also act as a windbreak from the east, north and west, which is especially important as this site is very exposed and the annual vegetable garden areas will benefit from the microclimate that is created by the windbreak. 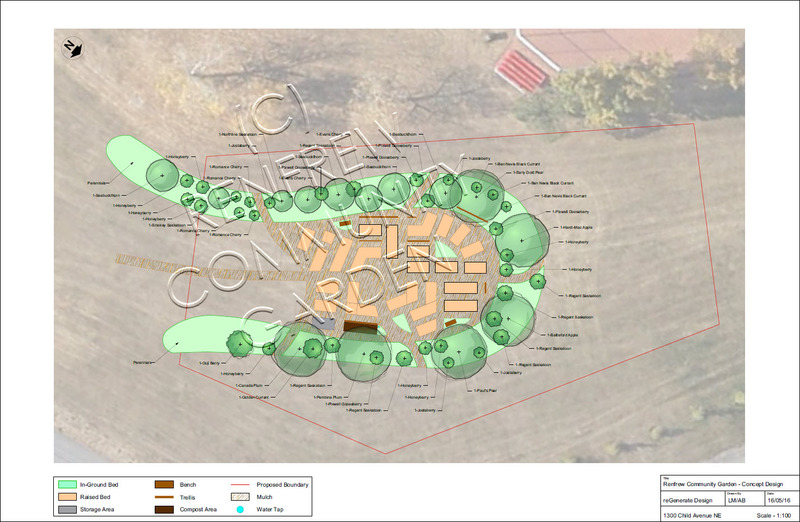 The food forest is designed to be water-harvesting swales on contour, which will capture and infiltrate the rain that falls directly on the site and the rain that washes down from the large recreational field adjacent to the site. This ensures the long-term sustainability of the food forest as it will capture and store valuable rainwater in our semi-arid climate, creating a self-sustaining and low-maintenance system once the perennials have established. Species selected for the perennial food forest area are well adapted to our prairie climate and will provide an excellent source of nutrient-dense, delicious, local food. The food forest will add diversity to the local ecosystem by the planting of more trees and shrubs, and will have a positive impact on our carbon footprint.